A lot of this is because House of Dark Shadows is a film adaptation of a daytime drama. Over the course of six sesons, Dark Shadows ran for a total of 1,220 episodes. That’s a lot of story to cram into a 97-minute film but director Dan Curtis does just that. The end result is an incredibly busy film and I mean that in the best way possible. Seriously, there are so many twists and turns in this film’s plot that it’s difficult to even know where to begin. This is one of the most incident-filled horror films that I’ve ever seen. No sooner does one plotline resolve itself than another begins. Meanwhile, a surprisingly large cast wanders through the shadows and tries not to get transformed into a vampire. Most of them do not succeed. In Maine, a lowlife handyman named Willie (John Karlen, giving the film’s best performance) breaks into a mausoleum and approaches a coffin that’s covered with chains. Willie thinks that there’s a treasure hidden in the coffin but, after he removes the chains, he instead discovers that he’s stumbled across the home of a vampire! Barnabas Collin (Jonathan Frid, who perfectly combines old world manners with thinly veiled menace) has spent 175 years trapped in that coffin and now that he’s been released, he’s not in a very good mood. Soon, Barnabas has introduced himself to his descendants (including Joan Bennett, as Elizabeth, the family matriarch) as a cousin from England. Everyone is impressed with Barnabas’s charm and courtly style. Of course, some people are a little bit skeptical. Prof. Stokes (Thayer David) notices that Barnabas doesn’t seem to know much about London while Dr. Hoffman (Grayson Hall) flat out accuses Barnabas of being a vampire. Barnabas admits that this is true but fear not! Dr. Hoffman’s fallen in love with him and wants to help cure him. Meanwhile, everyone in town is growing concerned about all of the bloodless bodies that are showing up. They especially get worried after Elizabeth’s daughter, Carolyn (Nancy Barrett), dies and then promptly comes back to life, complete with her own set of fangs…. House of Dark Shadows is a chaotic movie but it’s also a lot of fun. This is one of those films that you watch in amazement as it just keeps going and going, piling on one incident after another. Does the film always make sense? No, but it doesn’t have to. Quickly paced and featuring nonstop gore and fog, the film has a dream-like feel to it. Curtis and the cast attack the material with such unbridled enthusiasm that it doesn’t matter if the plot occasionally doesn’t always add up or if the dialogue is occasionally a bit clumsy. It’s impossible not to get swept along with the film’s insanity. 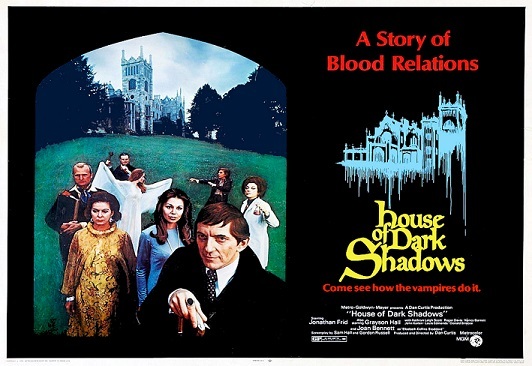 Probably because of its television roots, House of Dark Shadows is often dismissed by critics. (I’ve never seen any old episodes of the show so I can’t say how the movie compares to it.) Well, those dismissive critics are wrong. House of Dark Shadows is one of my favorite vampire films and it’s definitely one that deserves to be rediscovered.